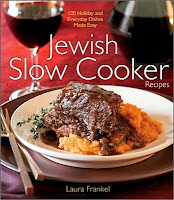 I recently reviewed Laura Frankel’s Jewish Slow Cooker Recipes: 120 Holiday and Everyday Dishes Made Easy (John Wiley & Sons, Inc., 2009) for my column at the j. newsweekly. You can read the article here. 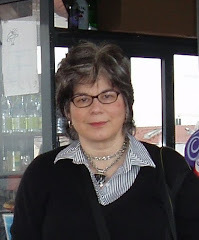 Frankel, a restaurant chef, a working mother, an observant Jew and a devoted slow cooker user, has Ashkenazi, Middle Eastern and Sephardic recipes in the book, but most of the recipes are for contemporary dishes from around the world that are not particularly “Jewish,” such as cassoulet, tortilla soup, wild mushroom stroganoff, Szechwan chicken, tamales, key lime cheesecake and flan. She also has lots of subsidiary recipes, including spice mixes, sauces and accompaniments, which she uses to develop the dishes’ tantalizing and fresh-tasting flavors. But that means many of the recipes have extra preparation steps. Doing these steps in advance (such as the night before) would help keep the slow cooker prep time down in the morning when you are in a hurry to just plop the ingredients in the cooker or in the evening when you need to finish off the dish before serving, important criteria for me. I do have one quibble. Frankel writes a lot about using the slow cooker for Shabbat luncheon meals, but most of the recipes cook in four to eight hours. I would have liked tips on how to start some of her other recipes on Friday afternoon to eat at Saturday lunch. Based on the back-of-the-jacket blurb “Your Slow Cooker: Not for Shabbat Only,” I assume she is writing for an audience that she feels already knows how to do this. Her emphasis definitely seems on using the slow cooker as just another kitchen preparation technique as opposed to only using it as a time-shifting convenience appliance. The book has a chart showing which recipes are pareve, meat or dairy and the recipes give options on how to alter from one category to another when appropriate. There is also a section on Jewish holiday menus. I like the idea of using the slow cooker to have some of a holiday dinner cook unattended while I fuss with the rest. Here is a recipe adapted from Jewish Slow Cooker Recipes. I love soups made in the slow cooker and liked the Middle Eastern feel of the Chickpea and Lentil Soup. Preheat a slow cooker to low. Heat the oil in a large sauté pan over medium heat. Sauté the carrots, celery, onion, fennel and garlic until lightly browned. Put the vegetables in the slow cooker insert. Add the lentils, check peas, crushed tomatoes with juice, coriander, cumin, lemon juice and stock. Cover and cook on low for 8 to 9 hours. Before serving adjust seasoning with salt and pepper. Serve the soup with the garnishes. The j. article also has a recipe for persimmon pudding made in a slow cooker. For slow cooker recipes I've featured here on Blog Appetit, click here. For slow cooker recipes elsewhere on the web, check out the blog A Year of Slow Cooking or this recipe for Hungarian pot roast from Kalyn's Kitchen. disclaimer: Cookbook was provided by the j. weekly, who received a promotional copy from the publisher. The soup sounds wonderful. This is just the sort of thing I like to cook in the slow cooker!